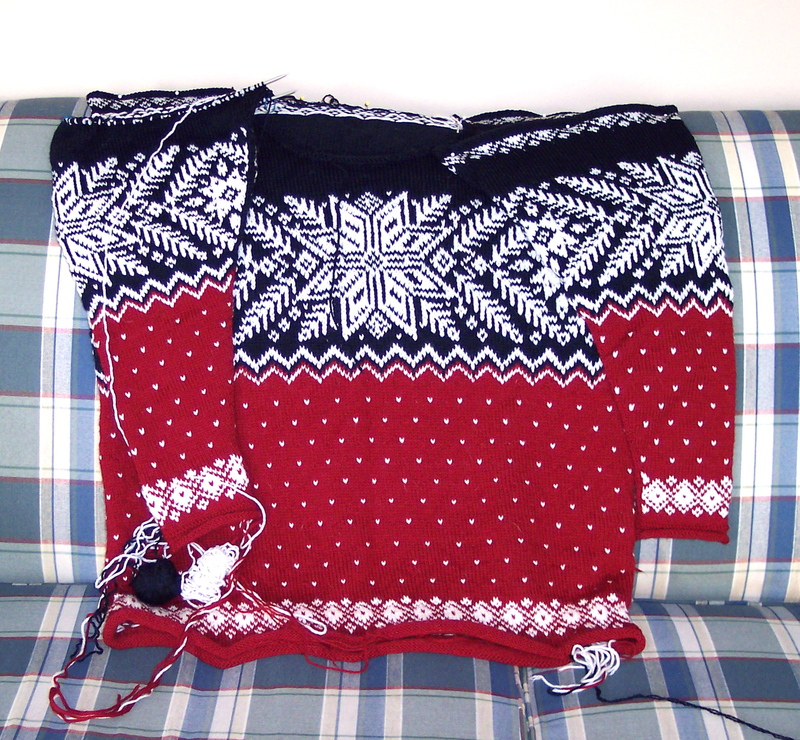 I had hoped to have my Dale of Norway sweater, Gjende, completed by the first snow, but, alas, it wasn’t to be. I’m still working on it, and it is nearly finished. See? I keep running into little annoying problems. I finished sleeve one and went to work on finishing sleeve two, but I had to undo a little of sleeve one in order to cannibalize some of the navy blue yarn. I explained in a previous blog entry that I was running short of navy blue yarn and ordered another ball from Knit Picks. Of course, the new ball is from a different dye lot, so the color doesn’t match the old yarn exactly. It’s pretty hard to tell the old from the new when the balls are placed side by side. But there is a difference. After I finished sleeve number two, I discovered that somewhere along the line, I ended up with either extra stitches in sleeve number one or too few stitches in sleeve number two. So now I’m going to rip back sleeve number one to the snowflake section and reknit the solid navy section, adjusting the increases so that I will end up with the same number of stitches as for sleeve number two. The extra stitches appear to have happened in the snowflake section, but there is no way I’m going to rip that out and reknit it. Yikes! The gansey that I’m knitting for the boy is on hold for the time being. I have the body and neck done, and one sleeve is knitted to the cuff. But I want him to try it on before I do any more work on it. I want to make sure the body fits okay and that the sleeve is long enough before I start the second sleeve. 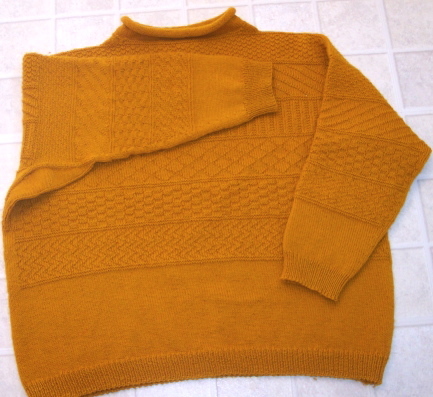 It has been a very enjoyable sweater to knit and has knitted up quickly. 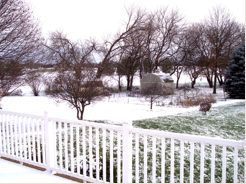 I’ll take some pictures of it eventually and share them with all three of the people who read my silly little blog. In the meantime, I naturally started another sweater. Never mind that Starmore’s Kinsale is sitting untouched in my knitting pile, or that my Szabo Shawl Collar Aran has been languishing three-quarters done for months now, or that my Orkney Pi shawl lacks only the knitted-on edging to be complete. I just had to start yet another project. This time I am making Beth Reinsel-Brown’s White Gansey in Knit Picks Merino Style in Nutmeg. The yarn is probably a very poor choice–it will probably pill like crazy–but it is very soft and nice to work with. The boy’s White Gansey was made in dark gold Dale Heilo. It’s quite lovely, don’t you think? Heilo is a great yarn that softens with every wash, and the sweater actually looks better with each washing. No fuzzing, felting, or pilling. I seriously doubt the Merino Style will wear so well.